A series of new images obtained by the spacecraft's telescopic Long Range Reconnaissance Imager (LORRI) during May 29-June 2 show Pluto is a complex world with very bright and very dark terrain, and areas of intermediate brightness in between. 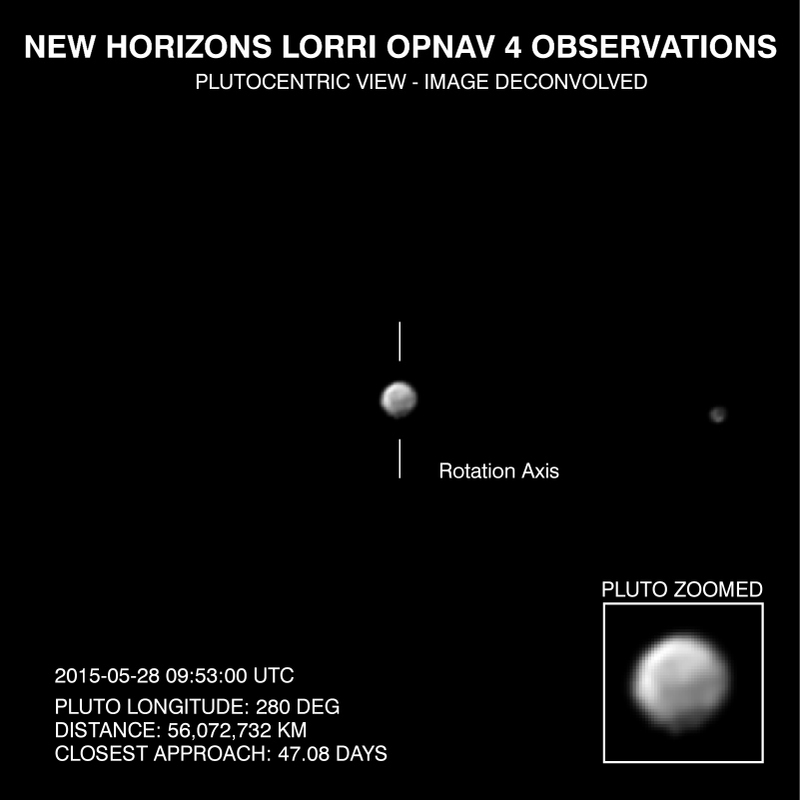 These images afford the best views ever obtained of the Pluto system. New Horizons scientists used a technique called deconvolution to sharpen the raw, unprocessed pictures that the spacecraft beams back to Earth; the contrast in these latest images has also been stretched to bring out additional details. Deconvolution can occasionally produce artifacts, so the team will be carefully reviewing newer images taken from closer range to determine whether some of the tantalizing details seen in the images released today persist. Pluto's non-spherical appearance in these images is not real; it results from a combination of the image-processing technique and Pluto's large variations in surface brightness. "Even though the latest images were made from more than 30 million miles away, they show an increasingly complex surface with clear evidence of discrete equatorial bright and dark regions—some that may also have variations in brightness," says New Horizons Principal Investigator Alan Stern, of the Southwest Research Institute, Boulder, Colorado. "We can also see that every face of Pluto is different and that Pluto's northern hemisphere displays substantial dark terrains, though both Pluto's darkest and its brightest known terrain units are just south of, or on, its equator. Why this is so is an emerging puzzle." "We've seen evidence of light and dark spots in Hubble Space Telescope images and in previous New Horizons pictures, but these new images indicate an increasingly complex and nuanced surface. Now, we want to start to learn more about what these various surface units might be and what's causing them. By early July we will have spectroscopic data to help pinpoint that." These images show dramatic variations in Pluto's surface features as it rotates. When a very large, dark region near Pluto's equator appears near the limb, it gives Pluto a distinctly, but false, non-spherical appearance. Pluto is known to be almost perfectly spherical from previous data. This "movie," composed of images taken by New Horizons’ Long Range Reconnaissance Imager (LORRI), shows Pluto as it rotates about its axis. The images were taken May 28-June 3, 2015, from distances ranging from approximately 56 million kilometers to 48.5 million kilometers. Visible are dramatic variations in Pluto's surface features as it rotates. When a very large, dark region near Pluto’s equator appears near the limb, it gives Pluto a distinctly, but false, non-spherical appearance. Pluto is known to be almost perfectly spherical from previous data. These images have been processed using a method called deconvolution, which sharpens the original images to enhance features on Pluto. Deconvolution can occasionally introduce "false" details, so the finest details in these pictures will need to be confirmed by images taken from closer range in the next few weeks. All of the images are displayed using the same brightness scale.